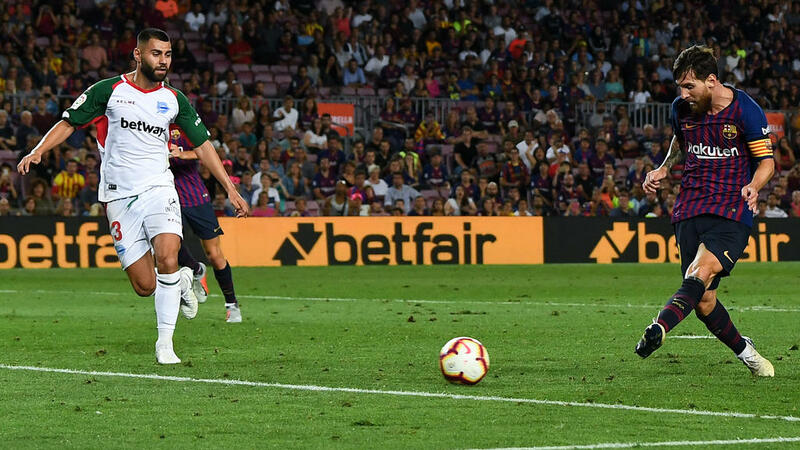 Wearing the captain's armband following the departure of Andres Iniesta to Japan, Messi stepped up to send a cheeky second-half free-kick under the jumping wall and into the net for the opener, and Barca's 6,000th La Liga goal. While they took their time to get going, it was an ideal opening result for Ernesto Valverde's side, who are hoping to once again see off the challenges of Real Madrid and Atletico Madrid in the battle for the title. The 31-year-old will be aiming to put behind him the desperate disappointment that was Argentina's World Cup campaign, and he was unlucky not to get a hat-trick here. Messi, the top scorer in La Liga last season, then controlled a ball into the box on his chest before slotting in his second and his team's third in stoppage time. Last season's runners-up Atletico, fresh from beating Real 4-2 after extra time in the UEFA Super Cup in Tallinn in midweek, start at Valencia on Monday. Cazorla started in Villarreal's season-opener at home to Real Sociedad, as his side took a first-half lead through Gerard Moreno. However, the visitors fought back to win 2-1 with goals from Willian Jose and Juanmi, giving the Basque club's new coach Asier Garitano the perfect start.